Bingo is an all-time classic game. 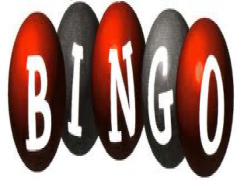 Hosting a bingo Event can bring many people together to unwind and even win a lot of prizes. This all-time favourite past time can become a great source of entertainment for your yearly event or even monthly event. Many companies are joining the fun, and exclusive events are held across South Africa. For those seeking a highly entertaining and unique idea for a party or event, hosting a bingo night or day offers a memorable evening of bingo, socializing and nail-biting tension – all in all, a highly enthralling way to spend an evening with a group of colleagues and friends! While 90-ball games can be easily played, 75-ball sets are also available depending on your preference. Themed parties take a novel twist by using symbols instead of numbers. We are able to change and incorporate your corporate idea or message into the event if need be. This adds an element of fun, and soon your guests will be having loads of fun as they play bingo and try to get all of their symbols crossed off first.